This afternoon we were suppose to have a birthday party for my nephew Gavin who turned six years old earlier in the month. So I got up early and made his birthday card so that I could tuck in his gift card from ToysRUs. But poor Gavin ended up at the ER this morning with a diagnosis of pneumonia, so his party was postponed to next weekend. Honestly, I love how his card turned out and I think that he’ll love it as well. The images are print & cut SVG files available from the Silhouette store (for personal use only). The file for the background was intended as a pop-up card, but I was afraid that such a card in the hands of a six year old would wear out quickly, so I printed the background image twice — first as a solid, uncut backdrop and the second time so that I’d get the areas that needed to be popped out. I then mounted it as a second layer using foam pop dots to give it dimension. After cutting out Batman on the Silhouette, I also used pop dots to attach him to the front so the card has lots of dimension. 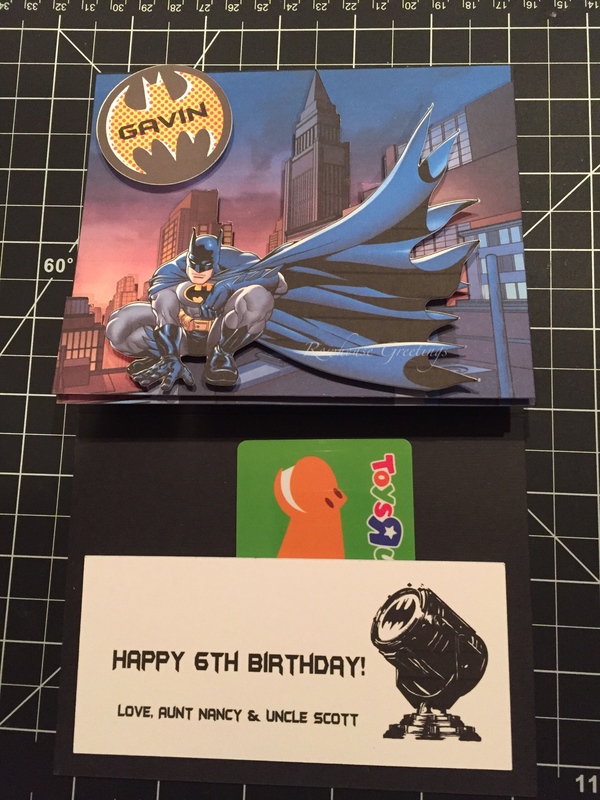 I added Gavin’s name to the reflection from the Bat light and used more pop dots to place it on the front of the card. The type font for the sentiment is (what else) Batman Forever and available to download at Dafont.com. Next Merry Everything and Happy Always! This is an absolutely awesome card, and he’s going to LOVE it!